One of the oldest – if not the oldest – design magazines in the world, founded in 1905. Form is a Stockholm-based bimonthly publication, covering architecture and design with a special focus on the Nordic region. Meet the industry’s top writers and photographers in Sweden’s oldest design magazine. Form’s journalism is independent and the sharpest in its genre in the country. Form covers all corners of the Nordic form map. From architecture and furniture design to textiles, industrial design, decorative arts and graphic design. The readers of Form are architects, designers, decorators, producers, and an engaged audience of design and architecture-savvy individuals. The editorial ambition in terms of photography, text and feature journalism has received considerable attention in recent years. A well-known example from autumn 2013 is the unveiling of the “ghost designer” of Prince Carl Philip. The article arouse nationwide debate and highlighted abuse of power in the world of design. 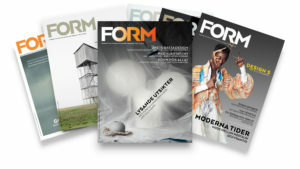 Form is published six times a year in two editions – one Swedish and one English version. Subscribers of the Swedish magazine also become members of Svensk Form and receive the many benefits of the membership. Read more here. Welcome to Form – the most vibrant and progressive title in design and architecture!